I just finished up this ring and it blew up my Instagram! So excited to have a design that people are excited about and responding to. 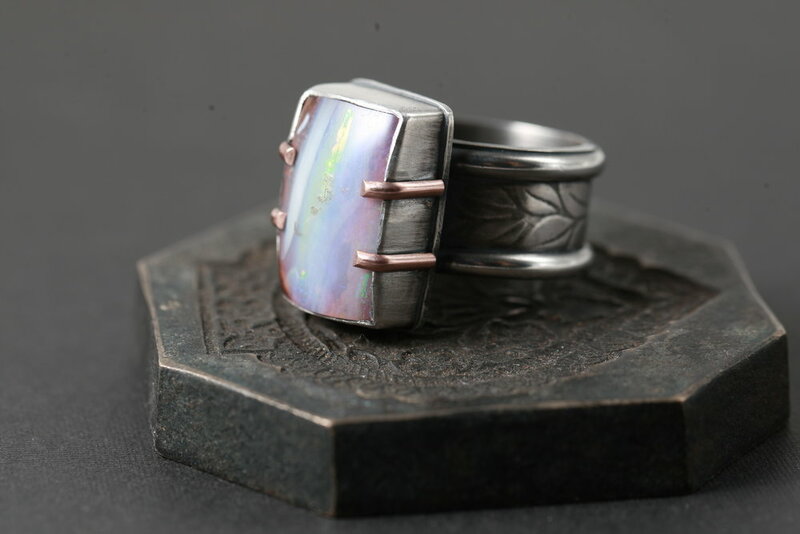 The opal is ethically sourced and mined directly from the Miner to me to you. I am trying to move towards knowing the exact source for all of my materials. I want to be sure that my jewelry is coming from the best locations in the world and that what I purchase to include in my jewelry is not in any way infringing on the rights of others. My jewelry is an expression of my love for the natural world so I am also going to be focusing on sustainable practices for myself (recycling metal) and for my stone suppliers. We need to protect this earth if want to continue to enjoy its beauty. The setting is a fine silver bezel with solid 14k pink gold prongs. I think it makes it look like an old relic. I worked so hard to make sure the bezel was filed to the exact shape of the stone and it really paid off! The bezel fits perfect. The band features a laurel leaf motif with half round wire. It is big and thick to make a statement for sure! Send me a message if you would like a custom ring made just for you.